Request a free copy of the Lifetime Adoption Magazine for your waiting room! 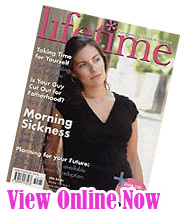 Lifetime Adoption Magazine is created for women considering adoption for their baby or child. Inside the magazine, you will find waiting adoptive families, valuable information on morning sickness, pregnancy and smoking, and the benefits of journaling during your pregnancy.